For this final post on dialogue, I will list some miscellaneous tips. 1. Don’t explain the spoken words. “Show, don’t tell” is crucial in dialogue. Don’t tell the emotions. For example: “It’s the queen scow crow!” Gordon shouted in terror. “In terror” is a telling phrase. Instead, show the terror. 2. Avoid using adverbs to dress up speaker tags. This is not a hard-and-fast rule, just something to watch for. “The engine is a goner,” Gordon said grimly. “Grimly” tells that he is grim. Instead show that he is grim. 3. Make the spoken words match the character. A prim and proper character’s speech would differ greatly from a character who tends toward street talk. 4. 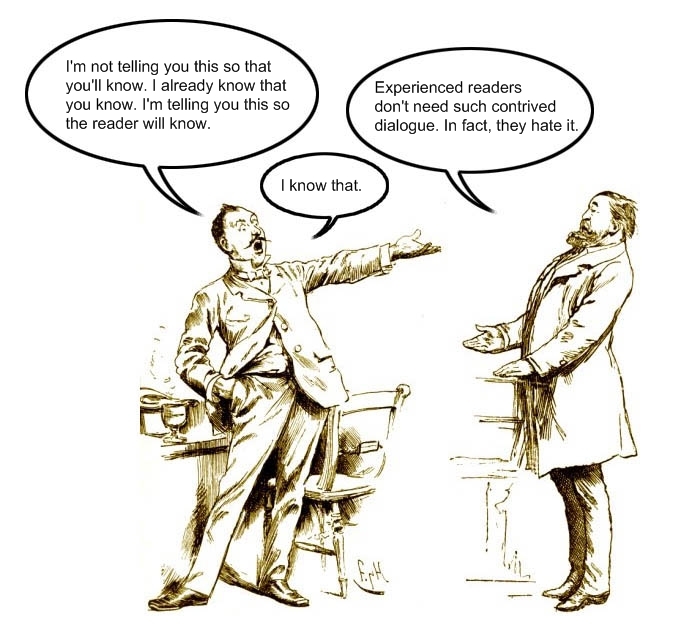 Avoid dialogue designed for the purpose of informing the reader. This is called “contrived” or “informational” dialogue. Since both characters know this information, they wouldn’t remind each other about it. This comes about when the author is trying to inform the reader. People don’t talk like this. 5. Show interruptions with a dash. Show pauses or trailing off with an ellipsis. That’s all for now. If you have any questions or comments, please post them. I already had the basic idea of street vs proper dialogue. Sometimes lines I wrote for my characters felt disconnected. I also remember you mentioning the ‘Show don’t tell’ philosophy, and the contrived dialogue. The other two tips are basically new to me. I never thought about using anything other than an ellipsis to show a character was interrupted, and I have to say my own writing has plenty of emotion-ed speaker tags. Time to look over it again. I think contrived speech can be a bit tricky sometimes. In Steins Gate’s first episode there was a scene where Mayuri called the main character, Okabe, and explained that there wasn’t much time left for her to get some collectable toys, and she didn’t have any 100 yen coins left to purchase any. Okabe at first replied with something like ‘We may be childhood friends, but I’m not loaning you money’. This may normally sound a little contrived, but I think it sounds natural since Mayuri was likely to have countered a refusal with ‘But I’ve been your best friend forever!’. So in this situation it could easily be Okabe heading off a counter argument he knew would have come. True. Deciding what is contrived and what is not can be tricky. What appears natural to one person might appear contrived to another. I realized with one of your examples there seemed to be a difference with how much info is provided. There was a difference between Okabe simply saying childhood friends and the person in your example saying student for three years and naming the school all in one sentence. Thank you for putting up all these writing tips. They’ve been really helpful and instructive! This is great! I always forget about avoiding adverbs with speaker tags, so this is very helpful. I don’t understand. Go on to the next sentence? Do you add another dot like. “My name is….” Or do you just use the ellipse as your period?